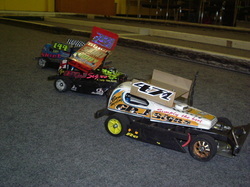 4 cell contact class, designed to replicate the full-size Ministox. Traditionally, the cars run without any suspension components whatsoever, using only the natural flex of the car’s rectangular GRP chassis to aid handling. Cars were originally limited to only using mechanical speed controllers, although ESCs have since become legal for this class. The class came about when Mardave launched their original Ministock kit, with beam front axle, mechanical speed controller and one-piece rear wheel/spur gear assemblies. A completely redesigned kit was launched in the late nineties, featuring V12 style wishbones on the front and a V12 motor pod; whilst retaining the basic suspension-less design of the original cars. 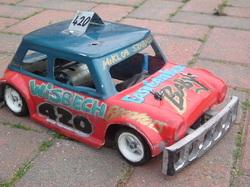 Competitors can build a BRCA legal car using any combination of old and new Mini parts, or similarly designed replacement parts (to allow for difficulty sourcing the original parts), or use one of the Mardave variations as a basis. The only one-make series in the BRCA today (and the only non-contact formula in the 1/12th oval section), the Hot Rod class came about with the launch of the Mardave V-Dub (later V12) kit in the late nineties. Originally, hot rods had a choice of 2 control tyres, mechanical speed controllers and Mardave control batteries, but the class has since evolved to arguably the flagship class for BRCA 1/12th oval racing section with a huge range of option parts available. 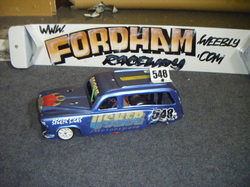 In 2009, the BRCA ran a brushless Hot Rod class at National level for the first time, where an open choice of motor/speed controller was permitted, within a price limit.The series was voted to be continued into 2010, alongside the brushed class, but discountinued for the 2011 season due to poor entry levels. 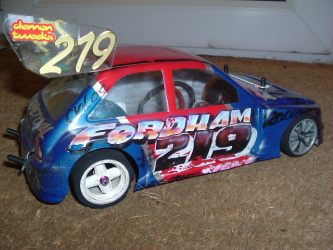 The original 1/12th oval class, Stockcars have been around since the late seventies/early eighties, with Mardave and Lectricar both selling production Stockcar kits in the early days of the sport. These cars originally ran on 4 cells, although as people began modifying these cars and putting home-made bottom chassis on them they eventually moved to 6 cells as the standard. Until 2009, BRCA rules dictated that cars had to run a mechanical speed controller, which could make packaging all the components inside the top-chassis a challenge, but 2010 regs saw competitors allowed to run ESCs for the first time. The banger class has been around since the days of the original Ministock, but has evolved into a more technologically advanced class with the release of Mardave’s V12-based banger kits. 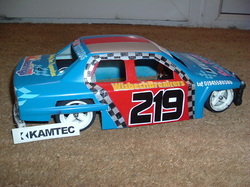 Most National banger competitors will use a V12 based car, although a Ministock based chassis is also legal, as is a hybrid of parts. An evolution of the Minis, the Modified Mini class became the Saloon class in the late eighties, with racers modifying their cars to run 6 cells as opposed to 4, and to handle better with some form of aftermarket/homebrew chassis. These cars were generally based on Ministock style parts with a beam front axle and a shock mounted onto alloy motor blocks, up until the early 2000s when racers started to utilise Mardave Hot Rod parts to build saloons instead.